Dr. Goldfischer is Chief of Breast Imaging and Associate Director, Leslie Simon Breast Care and Cytodiagnosis Center, Englewood Hospital and Medical Center, Englewood, NJ. Over the past 20 years, breast magnetic resonance imaging (MRI) has evolved into the most sensitive imaging modality for detecting breast cancer. However, acceptance of this diagnostic tool has only recently been established as percutaneous MRI-guided biopsy capability has been perfected. While the majority of enhancing lesions seen on MRI can be identified on ultrasound or targeted mammographic views, a significant number of lesions are only discernable on MRI. Understandably, many physicians were reluctant to employ a test that could detect possible cancers that could not be localized for biopsy or excision. With improved MRI biopsy capabilities, breast MRI’s utility in breast cancer detection and treatment should expand. Because the density of breast carcinoma and surrounding normal breast tissue can be similar, conventional mammography can miss 20% to 25% of cancers.1 While mammography screening has been shown to reduce breast cancer mortality, it is far less sensitive in women with dense breast tissue (dense breast tissue being deﬁned as having ≥50% ﬁbroglandular tissue and <50% fatty tissue). It is estimated that approximately half of the female population are classiﬁed as having dense breast tissue.2 Mammography also is less sensitive in women who have breast implants or who have had surgery or radiation therapy. As the technology has advanced over the last 20 years, breast MRI has emerged as the most sensitive imaging modality for early detection of breast cancer and for characterizing the extent of disease in women newly diagnosed by other modalities. Despite its sensitivity, breast MRI is not regarded as a screening tool largely because of its high cost — 10 times that of mammography. Also, the secondary costs generated by its high sensitivity and the additional tests needed to evaluate nonspeciﬁc ﬁndings have kept it from becoming part of the standard of care for all women.3 However, since March 2007, based on available evidence, the American Cancer Society and other medical societies have recommended that contrast-enhanced breast MRI be performed annually for a select group of high-risk women, whose lifetime risk is >20%, whether because of familial and personal histories, genetic makeup (BRCA1 or BRCA2 gene mutation carriers) or signiﬁcant exposure to radiation. When detected early, breast cancer can have a 100% survival rate, making early detection ever more critical. In the late 1980s, investigators studied the utility of contrast-enhanced breast MRI in evaluating women with known breast carcinoma. Thereafter, 2 different paths of inquiry were independently explored: the rate of contrast uptake by tumors and tumor morphology. Lesion detection with MRI depends upon the differences in the appearance of breast tissue before and after the IV administration of gadolinium, a paramagnetic agent. Areas that take up the contrast make the tissue turn white and are described as enhancing, due to relative increased blood ﬂow of the tumor with respect to breast parenchyma. Almost all cancers have increased blood ﬂow, but not all lesions with increased blood ﬂow are cancer. Additional evaluation of enhancing areas include assessment of the rate at which contrast enters and exits a region of interest, described as wash in and wash out of contrast. Malignancies are associated with a higher rate of wash in and wash out of contrast, whereas typically benign lesions are associated with a slower rate of enhancement and a longer time for contrast wash out. Despite efforts to improve the speciﬁcity of breast MRI by establishing time intensity curves, there is considerable overlap between rates of enhancement in benign and malignant tumors. There also is intralesion variability in the rates of enhancement. As a result, regions of contrast uptake also are characterized by their morphology as masses or non-mass–like areas of enhancement. Furthermore, their shape and borders are classiﬁed similar to the way in which masses are described mammographically, with smooth margins typical of benign entities and irregular or spiculated margins typical of malignancies. For non-mass lesions, the patterns of enhancement that are important are areas of clumped (grouped), segmental or linear enhancement which may indicate the presence of intraductal cancers. 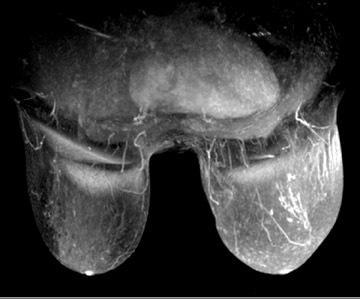 It is only with the current generation of imaging techniques that both morphology and enhancement patterns can be evaluated in the same study. Despite these advances, ambiguity may still exist, and if no mammogram or sonogram correlation can be found for an area of enhancement on MRI, then MRI-guided biopsy is needed to exclude the presence of malignancy. Some studies have shown MRI to have a sensitivity rate as high as 100% for breast cancers >3 mm.4 However, studies also reveal a varying speciﬁcity, ranging from 37% to 86%.5 Because of this dichotomy, the ability to obtain a tissue diagnosis of suspicious lesions becomes critical. The ability to perform MR-guided breast biopsy or localization therefore becomes an integral component of a dedicated breast MRI program. Early on, MRI biopsies were performed by placing either a wire or a titanium clip with MRI guidance into the area of enhancement to guide surgical excision. MRI-guided percutaneous biopsy was the ultimate goal for the same reasons that this less-invasive technique evolved for mammogram-guided and ultrasound-guided biopsies; it is less expensive because no operating room facilities are needed, and there are fewer side effects due to the lack of anesthesia. In addition, the incisions are much smaller, usually <5 mm as opposed to a surgical incision of ≥2 cm. 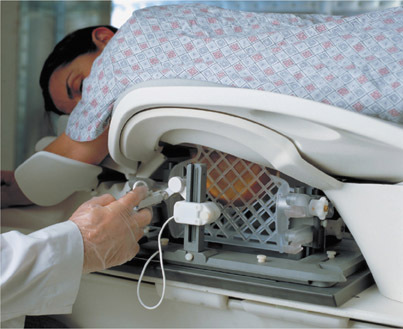 Initially, localizing biopsy grids were constructed as add-on devices to conventional MRI scanners. The earlier systems made it difﬁcult to approach breast lesions located posteriorly or medially. Using a dedicated breast MRI system with specially designed immobilization paddles resolves some of the issues associated with the add-on units (Figure 1). The newer system is designed for both medial and lateral approaches. It allows for biopsy of lesions that are close to the chest wall and to the sternum. With new localization technology on dedicated breast MRI machines, few, if any, lesions are unapproachable. The immobilization paddles are the key to precise lesion targeting. Breast MRI biopsies are unique in that the target is often only seen on the immediate postcontrast images. Malignancies are characterized by rapid enhancement and wash out of contrast, so that the target may fade into the background of breast parenchyma during the course of the procedure. The immobilization paddles provide the stability needed to perform the procedure with the highest degree of accuracy. If the patient moves during the procedure, and if the target is shifted even slightly, the region of interest may not be recognized and the target could be missed. As with stereotactic biopsy, the computer on the dedicated breast MRI system calculates the intersecting X, Y and Z coordinates for needle placement, which remains stable and the only means of knowing where the target is located after the contrast leaves. The design improvements have made percutaneous MRI-guided breast biopsy more accurate, making it a more valuable tool in the diagnosis and treatment of breast cancer. After the MRI biopsy, a mammogram is performed, not to detect the lesion, but to conﬁrm the clip is in the breast and to evaluate its placement relative to the target area. A hematoma or air typically indicates the cavity where the tissue was excised. Sometimes the clip is not precisely where the biopsy cavity was. Should the pathology be discordant with the MRI appearance, a post-procedure scan should be repeated to be certain that the target was adequately sampled. It is strongly recommended that the MRI be repeated after benign biopsy ﬁndings, but studies suggest that the compliance rate is poor. There is general agreement today that women can beneﬁt from breast MRI in the course of preoperative treatment planning. When women are diagnosed with breast cancer, the current standard of practice is to perform a clinical breast exam and mammography of the contralateral breast. Up to 10% of women who have received treatment for unilateral breast cancer will have malignant lesions in the contralateral breast even though it is not detected when the original diagnosis is made (Figure 2).6 A study by Lehman et al. reported that MRI scans of the contralateral breast can ﬁnd early-stage tumors that other modalities cannot. In this study, the rate of ﬁnding benign disease on biopsy from the MRIs was relatively low.6 Thus the beneﬁts of MRI scans of the contralateral breast in known cancer patients outweigh the cost. The ability to biopsy any additional ﬁndings underscores the value of MRI of the contralateral breast. One of the earliest, noninvasive forms of breast cancer is ductal carcinoma in situ (DCIS), which has a 100% survival rate. Nearly all invasive breast carcinoma is believed to begin as DCIS — high-grade is the form that most likely progresses and becomes a clinically apparent cancer. About 20% of all new breast cancers are DCIS. Ninety percent of DCIS seen on mammography is associated with calciﬁcations, but only about a third of DCIS has calciﬁcations.9 Therefore, with mammography, it is easy to miss a signiﬁcant amount of DCIS. As additional studies conﬁrm that MRI has a higher detection rate for DCIS than mammography, it should be readily included in breast imaging practices, especially for patients with dense breasts and who are at a high risk for developing breast cancer (Figure 3). When MRI machines have biopsy capabilities built-in, it takes away the fear of ﬁnding lesions that cannot be further evaluated. With better methods for biopsy of MRI-detected lesions available, more women can beneﬁt from breast MRI. As higher resolution breast MRI images and advanced biopsy capabilities become more readily available, MRI-directed biopsy will have an even greater role in breast cancer detection and treatment. Breast MRI can identify cancers that cannot be found by mammography, ultrasound or physical examination. Yet its widespread adoption has been slowed because of the high cost and because of an initial concern that lesions could not be easily sampled or excised. Improving the capabilities of breast MRI biopsy has eliminated that fear and should move breast MRI to the forefront of standard practice, especially for women who are newly diagnosed with breast cancer, as well as those who are classiﬁed as high-risk. While still a relatively new imaging technique, the high sensitivity of breast MRI may be used to its optimal advantage now that small, previously equivocal lesions detected by MRI have become amenable to histologic evaluation. Jackson VP, Hendrick RE, Feig FA, Kopans DB. Imaging of the radiographically dense breast. Radiology. 1993;188:297–301. Tabar L, Vitak B, Chen HH, et al. Beyond randomized controlled trials: Organized mammographic screening substantially reduces breast cancer mortality. Cancer. 2001;91:1724–1731. Hall F.The Rise and impending decline of screening mammography. Radiology. 2008; 247: 597–601. Harms SE, Flamig DP, Hesley KI, et al. MR imaging of the breast with rotating delivery of excitation off resonance: Clinical experience with pathologic correlation. Radiology. 1993:187:493–501. Orel SG, Schnall MD, LiVolsi VA, Troupin RH. Suspicious breast lesions. 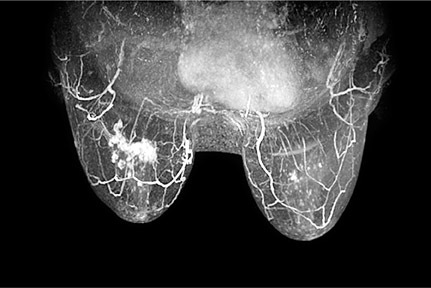 MR Imaging with radiologic-pathologic correlation. Radiology. 1994;190:485–493. Lehman, CD, Gotsonis C, Kuhl CK, et al. MRI evaluation of the contralateral breast in women with recently diagnosed breast cancer. N Engl J Med. 2007;356:1295-1300. Boetes C, Mann R. Ductal carcinoma in situ and breast MRI. Lancet. 2007;370:459–460. Kumar AS, Chen DF, Au A, et al. Biologic signiﬁcance of false-positive magnetic resonance imaging enhancement in the setting of ductal carcinoma in situ. Am J Surg. 2006;192:520–524. Stomper, PC, Margolin, FR, Ductal carcinoma in situ: The mammographer’s perspective. Am J Roentgenol. 1994;162:585–591. MRI-guided breast biopsy. Appl Radiol.